New York is a bucket-list destination for many travellers around the world. However, getting there is often expensive and supporting yourself can be even more expensive! New York is not a cheap city and you need to have plenty of money ready before you go. Nevertheless, it is possible to enjoy everything New York has to offer on a budget. Let’s take a look at some of the ways you can save money now. When it comes to saving money, most of the work is done in the planning stage before you even set foot in New York. You can often pick up great deals on flights to New York depending on the time of year. Some airlines run great deals at certain times of the year. You might also get a great deal if you fly somewhere else in the Americas first and then fly onto New York. Check out some great flights here; https://www.flyporter.com/en-ca/book-flights/where-we-fly/usa/new-york. If you are thinking about where to lay your head at night then you need to consider heading out to the more residential areas if you want to save some money. You can often find better deals in the Village or Tribeca than you would if stayed in the vicinity of Times Square. You may even find things cheaper if you stay outside Manhattan or even in New Jersey. Even factoring the cost of travelling into New York each day will be peanuts when you otherwise consider that you could be shelling out top dollar for a grimy city centre hotel. We know which option we would rather choose. Of course, one of the best ways to save money is to stay in a hostel instead of a hotel. You can find amazing hostels all over the New York area. What’s more, they may end up being nicer than some budget hotel rooms. If you are looking to get the most for your money, a hostel might be a great way forward if you aren’t afraid to share. Yes, it would be cool to venture up the Empire State Building and grab a selfie in front of the Statue of Liberty. However, both of those things are quite expensive to do. Why bother when you can instead grab just as good a picture from the Staten Island ferry? So many people neglect to visit this ferry but it really offers some tremendous views and a chance to sit and watch the world go past. If you want a little breather from the madness of New York, this ferry might be able to offer it to you. Many people want to check out the various exhibits on show at the Met but few people want to pay the entrance fee. However, the Met is free on Fridays after 4PM. These nights can be quite popular (who doesn’t love a freebie?) so get there either on the early or the late side to avoid the queues. If you want to head into some of the more popular tourist attractions, look into the City Pass. With this handy card, you can get into either 3 or 6 attractions depending on which variation you go for. You can head to popular sites like the 9/11 Memorial Museum or the Museum of Natural History with this card. It could save you some money if you need it and you don’t have to miss out on some of the best attractions the city has to offer. Carrie Bradshaw might only travel in yellow cabs but the budget traveller cannot afford to do so. Thanks to the rise of Uber, transport around New York might be a little more affordable than usual but you should still make sure that you only use it in an emergency if you are trying to save money. Instead, make like the New Yorkers and head down into the subway. You can get nearly everywhere in the city using the subway and the places you can’t get to are probably not that far of a walk away. If you are going to be in New York for a little while, think about getting a 7-day Metro Card as that might save you quite a bit of money. Everyone uses the subway so you are probably going to see some interesting sights while you are down there. However, it is also a great way to get a little closer to the everyday people of New York so enjoy it. Central Park is probably on top of a lot of people’s lists when it comes to New York but few people know how wonderful it truly is. You could probably happily spend an entire day relaxing and exploring there without any issue. There are 36 acres of paths, trails, and scenery to explore. Even if you aren’t much of a twitcher, bird-watching is a must as the park is home to many different species. If you would rather people-watch, head to Sheep Meadow. It is a 15-acre field where locals and tourists congregate when they can to play games, practice acrobatics and just take some time to chill. Another attraction you should try to find is the Alice in Wonderland statue. She is a bronze statue of this famous little girl and her pet cat and she is loved by both locals and tourists. The final place you should definitely visit in Central Park is the Conservatory Garden. It takes influence from 3 European styles – English, French, and Italian – and is a beautiful place to spend some time. It is also, however, extremely popular with wedding shoots so be prepared to stop and start on your walk or get ready to feature as an unwanted addition to some happy couple’s wedding album. New York has some of the finest cuisine in the world and, even on a budget, you can enjoy it. Head to one of the many food trucks to grab a great meal for a low price. With everything from falafel and kebabs, to the iconic New York pizza, to amazing vegan dishes and more, you are spoilt for choice. Another great alternative is to head into the city’s ethnic areas. From Chinatown to Little Italy, there are many places where you can find authentic cuisine made by those who can do it best. You don’t have to break the bank out here too. There is always some little restaurant tucked out of the way which is full of happy patrons and ready to bring you the best food you have ever tasted. New York has a reputation for being a city which is expensive and busy. While it is always going to be busy, it is only expensive if you want it to be. 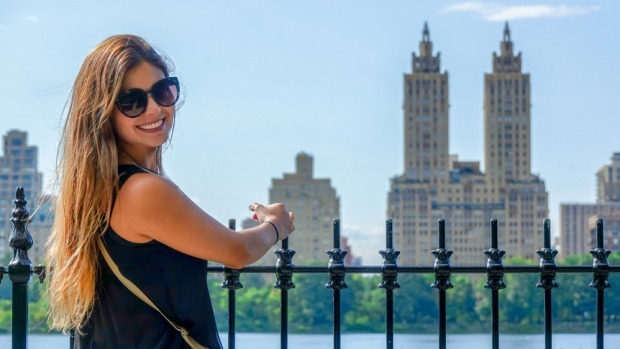 It is perfectly possible to enjoy New York on a budget if you are prepared to be strict with yourself and make certain sacrifices here and there. The Big Apple is waiting for you so don’t be afraid to take the plunge and plan your trip there today!